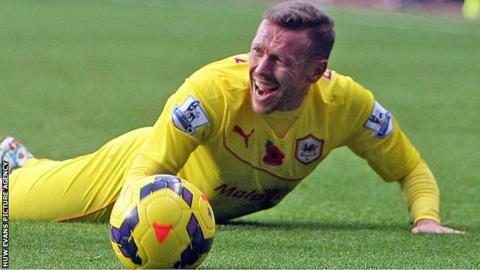 Craig Bellamy is back in contention for selection for Cardiff City's trip to Crystal Palace in the Premier League. The former Wales captain has not played since the loss at Aston Villa on 9 November. He was not considered for the 0-0 draw with Stoke on Wednesday because of a hamstring injury. Cardiff City chairman Mehmet Dalman is keen to introduce someone with football experience to the club's board. "Would you go to hospital and allow anyone to operate on you if they didn't have a degree in medicine? You wouldn't," he said. "I think you need expertise and it would be nice... to have somebody - a grey-haired chap - experienced in football matters who could sit there to bounce some ideas off. "Preferably somebody who's done it all, seen it all, I just think it would be of value to the club." Dalman denied he was looking to appoint a director of football, and said he had no timetable in mind. "It was something that we felt wasn't going to be quite right midweek but would be right for the weekend," said manager Malky Mackay. "He had a tightness in his hamstring and we decided to leave him behind." Mackay's team have not won since their 1-0 triumph over Swansea on 3 November, a run that includes a 2-2 draw with Manchester United. And the Scotsman is taking nothing for granted in spite of Palace's lowly position in the Premier League. Mackay does not feel Palace are any worse than other teams in the bottom half of the table. However, he added it will take new manager - Welshman Tony Pulis - time to mould the team to his style. "Tony's a very experienced man, a very experienced manager - someone who does a lot of hard work with his team," added Mackay. "It's going to take him time to mould Palace in the way he wants it. That'll probably take three transfer windows for that to happen so it's the same group of players he's got. "How he conveys what he wants them to do and the tactics he wants them to employ will be up to him." Pulis started his tenure at Selhurst Park with a 1-0 win over West Ham on Tuesday night.